SAP—in its present form, running in the veins of small, mid to large companies is gaining more momentum due to its capability to fulfil niche requirements with the power of Cloud. The spectrum of SAP products is not only allowing companies to manage and optimize businesses but is also proving to be an integral part of their information systems architecture. With the market embracing different modules of the software, the demand for interaction and collaboration between application suites to streamline business is witnessing ascend. Most SAP solution providers are therefore offering integrated solutions that could be deployed on premise as well as through a private cloud placement, sensing the need of the small and medium enterprise businesses. The pioneer—SAP, has allowed many companies to step forward and build tools to integrate SAP ideas into different business verticals as it guarantees consistency of data throughout the system and the company itself, enabling clients perform and deliver better results. These myriad innovations call for experts to transform SAP software and technologies into solutions that address strategic business needs. This is where SAP consulting companies play the role of a propeller to drive the company into achieving excellence. The expertise of the consultants to provide right data at the right time enables the marketplace to acquire sustainability, flexibility and succeed through innovation. Most players in this space offer advisory and process consulting through to implementation to support and hosting. 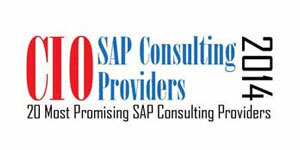 In this edition of CIO Review, we bring to you “20 Most Promising SAP Solution Providers 2014” and “20 Most Promising SAP Consulting Companies 2014”, featuring the best vendors and consultants providing technologies and services related to SAP. The companies featured have showcased extensive business process knowledge, in-depth integrated and innovative strategies combined with talent base across locations. A distinguished panel comprising of CEOs, CIOs, VCs, analysts including CIO Review editorial board has decided the top companies that are at the forefront of tackling challenges in the SAP market in the U.S.
Amick Brown Provides innovative and effective SAP solution along with high value, low cost, flexible staffing solutions tailored to meet fluctuating IT demands.